Last week, the biggest public rally to date against China’s growing influence in Central Asia took place in Kyrgyzstan’s capital. 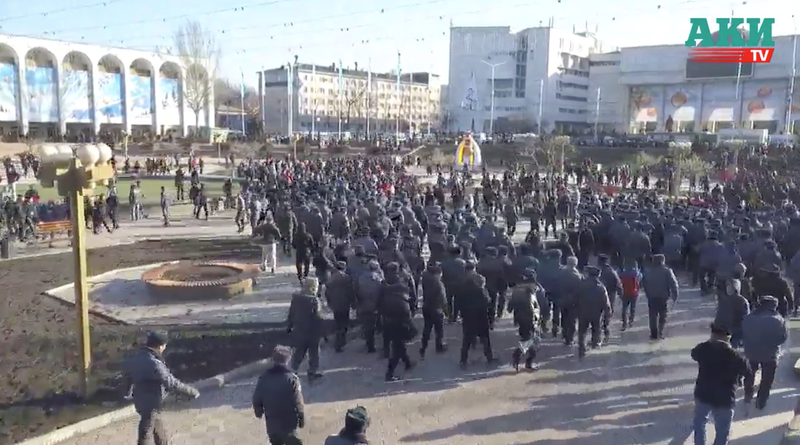 On Thursday, January 17, police detained more than a dozen people assembled in Bishkek’s central Ala-Too Square, demanding a curb on work permits for Chinese nationals as well as other measures to reduce the Chinese presence in the country. Similar protests took place on January 7 and on December 20, 2018, when a crowd of about 150 people gathered near the Chinese Embassy. The demonstrators’ other demands ranged from reducing Kyrgyzstan’s debts to China to a ban on Kyrgyz-Chinese marriages. Protestors also expressed support for ethnic Kyrgyz allegedly being persecuted in re-education camps in Xinjiang, also known as East Turkmenistan, which is a neighboring province occupied by China since 1949. Since 2014, China has used these camps to detain and indoctrinate the region’s Uyghur population, an ethnically Turkic, Muslim minority in China that has long opposed the Chinese occupation of its homeland. So far, the Kyrgyz government has reacted to the protests with silence. That being said, in a speech President Sooronbai Jeenbekov said that Kyrgyzstan should be grateful to have a neighbor like China – a major trading partner and supplier of aid – and threatened to “take measures” against those who are out to damage Kyrgyz-Chinese relations. Although Chinese-Kyrgyz relations have historically been tense at times, the two countries have generally been important trading partners. Kyrgyzstan has benefited greatly from projects funded through China’s Belt and Road Initiative (BRI). More than 50% of Kyrgyzstan’s imports come from China and the re-export of Chinese-manufactured consumer products in the Osh region is one the country’s two largest economic activities. Relations between the two countries have further benefited from joint military exercises under the umbrella of the Shanghai Cooperation Organization. Anti-Chinese sentiment has grown in Kyrgyzstan, and other former Soviet republics in Central Asia, since the breakdown of Bishkek’s main power plant in January 2018 caused a five-day blackout following modernization by a Chinese firm. Hostility toward Beijing has also been fed by the mass detentions in East Turkmenistan. Interestingly, most protests have been staged by the nationalist group Kyrk Choro (“Forty Knights”), which first surfaced in December 2014 after raiding a karaoke bar, out of concern that its young Kyrgyz waitresses were providing sexual services to the mainly Chinese clientele. Whatever the motives behind the recent – and so far rather limited – anti-Chinese protests, Kyrgyzstan cannot afford to alienate its economically important neighbor.